Miss Grand International 2016 has just crowned its winner in Las Vegas, USA. She is Miss Indonesia Ariska Putri Pertiwi, who also won Best National Costume award. 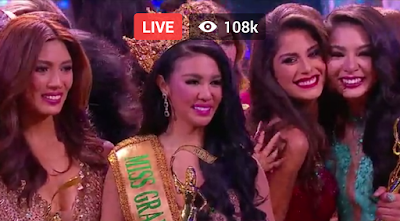 It's Indonesia's first time ever to win Miss Grand International, winning over 75 other candidates. It was also the first time that an Asian woman has been crowned in the 4-year-old pageant. Actually, the Top 3 finishers this 2016 were all from Asia. Behind Miss Indonesia were Miss Philippines Nicole Cordoves and Miss Thailand Supaporn Malisorn as the 1st and 2nd Runners Up respectively. Puerto Rico's Madison Sara Anderson came in 4th Place (3rd Runner Up), while host delegate Miss USA Michelle Gabriela Leon was the 4th Runner Up.